In this statement, Picasso hints at the fascination that children’s drawings exerted not just on him, but countless other artists of his generation, such as Münter, Kandinsky, Klee, Kokoschka, Miró, and Chagall to name but a few: the freedom and lack of pretension with which children capture their world on paper. 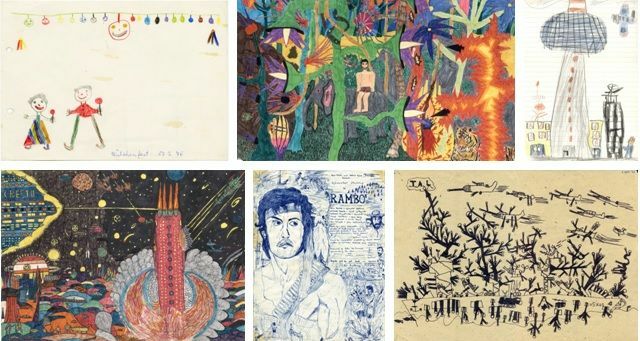 In the exhibition PAPERWORLDS, curators Valeska Hageney and Sylvia Volz present over 60 childhood drawings made by living artists who are now international figures in the art world. PAPERWORLDS goes on show at me Collectors Room from 21 January 2014 and features work by nineteen contemporary artists, including: Norbert Bisky, John Bock, Andy Hope 1930, Jonathan Meese, Tal R, Katja Strunz, Rosemarie Trockel, and Thomas Zipp. They provide us with a rare, private glimpse of drawings they created between the ages of three and fourteen. The sheets on display here reveal a wide range of imagined figures and imagined worlds, knights, landscapes, cities, portraits, but also everyday scenes, keenly observed and interpreted by the eye of a child. The broad sweep of subjects reflects the artists’ diverse origins. Many come from different, even opposing, cultural backgrounds and political systems, such as former West and East Germany, Israel, Denmark, and the United States. At age seven for instance, Norbert Bisky, who grew up in the GDR, makes a drawing of a military parade. So fascinated was young Olaf Holzapfel by the Mercedes three-point star which rotated as the rooftop illumination of the Europa Center (West Berlin), and which was also visible in East Berlin, that he incorporated it into his drawing of Alexanderplatz, made when he was just six years old. The childhood drawings of Katja Strunz, on the other hand, portray West-German, middle-class, small-town idylls with construction sites for future detached homes.In complete contrast to that stand the thoughts and life-world of Tal R; his pictures depict armed men, tanks, warships, and air raids. The influence of television and other media is also evident in many of the works, in the drawings of Michael Kunze, for instance. He uses coloured felt-tip pens to depict space battles inspired by science fiction and comics. Ralf Ziervogel, on the other hand, recreates – in rich detail and using a fountain pen – the posters of all three films from the Rambo series, incorporating into them passages of text and depictions of individual scenes to form collages. Looking at the juvenilia on show here, we repeatedly catch glimpses that pre-echo the works the artists produce today. As viewers we start searching for similarities, continuities, and radical departures. Do these childhood drawings hold clues to the artists’ work as adults? Can we even occasionally draw parallels between the two? With its collection of childhood drawings by contemporary artists, PAPERWORLDS also taps into a wider phenomenon: our ongoing fascination with the child’s imagination which started in the 18th and 19th century. Since that time, children’s drawings have been seized on by both artists and exhibition creators of the avant-garde as products of the immediate creative impulse, whose essence was worthy of emulation. Today such an ideologically motivated public examination of children’s drawings as a potential source of inspiration or supposedly pure form of expression is much less common. Nevertheless, since the mid-1990s a growing number of exhibitions have again been devoted to children’s drawings, and by extension the theme of childhood, at such high-profile museums as Lehnbachhaus, Munich (1995), Kunsthalle Emden (2012), and the Hamburger Bahnhof, Berlin (2012). However, these exhibitions have rarely examined the childhood drawings of living artists known to a wider public today. In the PAPERWOLDS exhibition at me Collectors Room, such artists now grant us a rare glimpse into their earliest beginnings and lift the curtain on themselves as individuals, at a stage in their life when they had not yet made a career out of art and when a drawing was just a kid’s drawing. Please find the list of exhibits here. A catalogue has been published by Verlag Kettler in May 2014 to accompany the exhibition. The catalogue is available at me Collectors Room.